Is the poison/explosive/biomarker really there? 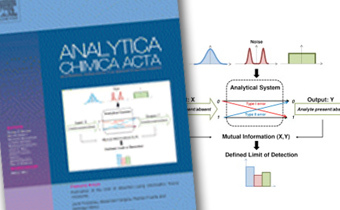 A paper by IBEC’s Signal and Information Processing for Sensing Systems group and their collaborators is the featured article and appears on the cover of the latest issue of Analytica Chimica Acta. “Estimation of the Limit of Detection Using Information Theory Measures” addresses the problem of the Limit of Detection (LOD) in analytical methods or measurement instruments. The LOD specifies the smallest quantity at which an analyte can be detected or distinguished from a measurement performed in the absence of the analyte. This means it is a limiting factor in the chemical detection systems – which are used in such wide-ranging applications such as disease diagnosis, environmental monitoring, poisons detection and security – where false positives or negatives can be disastrous. With this in mind, the researchers propose a new way of defining the LOD in which, unlike in existing probabilistic methods, the relevant magnitude becomes the amount of information (in bits) the measurement provides about the presence or absence of the analyte. This more principled approach easily shows that the noise type is an important factor on the information that may be extracted from the measurement. The journal cover shows a scheme of the principle behind the new proposed methodology.